"We're moving to your house - the one from your dream." Siena sees what isn't there, collects what's left behind. "Lucca led me to his room, and then just stood in the middle, waiting for me to notice something." Her brother Lucca hasn't spoken for over a year. Can the secrets of the past help Siena break her brother's silence? Siena has always had strange dreams and visions of things that aren't really there. For example, she might be walking down the street and suddenly see the environment change to the same street but from fifty years ago. But that's not the only strange thing about Siena; she can also sense ghosts, as can her little brother Lucca who hasn't uttered a word for just over a year. Life is understandably very frustrating and also a little creepy for their family. So when they all move to a house on the beach in Maine, which just so happens to be the exact house from Siena's recurring dreams, is life going to get better...or worse? This book is absolutely brilliant. The characters are well-formed - I especially liked Lucca, because even though he didn't speak, I felt like I knew him and my empathy for him was strong. I also really liked Sam - a local from Maine, where Siena and her family moved - because he was nice to Siena and I think she deserved that, as she hadn't received much kindness in the past. I was a bit suspicious of Morgan in the beginning but she was still a cool character! 'Listening for Lucca' is a rather short read - only 229 pages - which was a nice break from the usual long novels I have to read! In my opinion it is perfect for summer as it is mainly set around the beach, and even though it was short I don't think there was any more of the story to be told. Overall, the length was perfect and it's not often I can say that about a book! To conclude, I highly recommend that you read this beautifully written book. The cover is gorgeous and definitely reflects the story within! 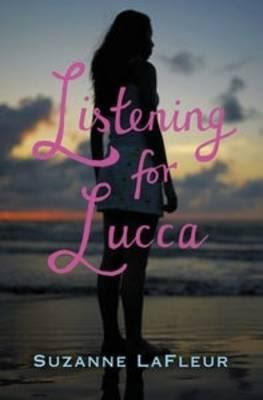 'Listening for Lucca' is definitely a must-read. Ever since I read LaFleur's other book, Eight Keys back in 2011 (review here), I have been aching for another of her books. And here it is! Overall, my rating for this incredible book is 5/5. Ooh, I've heard of Listening for Lucca but didn't actually know what it was about until now. It sounds really good and I'm glad you enjoyed it - will definitely be looking out for this one. Lovely review! This sounds so good! Will definitely be keeping an eye out for it now. Glad you liked it, Slothy! I thought I'd read Love Aubrey but now I'm not sure! Oh well. Hope you get to read this book!